Your variable APR will be, based on the Prime Rate, 18.99% or 24.99%, depending on how you meet our credit criteria. A balance transfer fee1 of 5% applies to each balance transfer that you make (minimum $10). ²See Rewards Terms and Conditions in the Summary of Credit Terms for details. 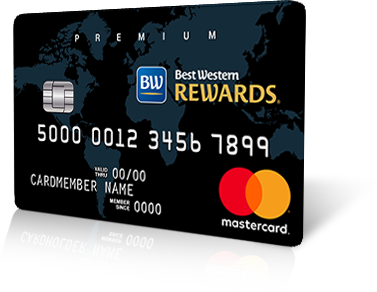 For Best Western Rewards® program Terms and Conditions including earning, redemption, expiration or forfeiture, please visit www.bestwestern.com/rewards/benefits/terms.asp. The average free night stay is 16,000 points per night. Best Western free night stays range from 8,000 to 36,000 points per night. For more information on 10% discount, please visit www.bwrcarddiscount.com. Each Best Western® branded hotel is independently owned and operated and Best Western and the Best Western marks are service marks or registered service marks of Best Western International, Inc.
4FICO is a registered trademark of Fair Isaac Corporation in the United States and other countries. Please note, new cardmembers will generally see their FICO® Bankcard Score 9 (the version of FICO® Credit Score we use to manage your account) within 45 days of account opening. 5Complete program details including restrictions, limitations and exclusions, will be provided when you become a cardmember. 6Zero Liability does not apply to Mastercard-branded cards issued to an entity other than a natural person; primarily for business, commercial, or agricultural purposes; outside of the U.S. region; or if a PIN is used as the cardmember verification method for the unauthorized transaction(s). ¹For additional information about Annual Percentage Rates (APRs), fees and other costs, please see the Summary of Credit Terms.